Rossendale is a district with a number of small towns around the valley of the River Irwell. There’s some urban areas and villages, too. A lot of commuters live here. It’s an artsy place and there are several studios around the Waterfoot area. Taste the Cracklin are hog roast caterers in Rossendale and for those with a more hands on attitude, we can provide a hog roast machine that you can hire from us and do it yourself. We get a lot of business from the larger areas like Rawtenstall, but we go out to the villages too. When we do the catering we include balloons, condiments, and bread rolls; all our hog roasts come with crackling. I love catering; I’ve been in the industry a long time and for years it was my dream to set up a catering business in Rossendale. And it’s worked – we’re always busy here at Taste the Cracklin! Yesterday we catered for a corporate event in Bacup, one of the larger towns. We’d found the hotel easily enough, and were quickly putting up balloons in the company colours. We soon had everything ready – tables set and the roast turning slowly in the machine, giving off a slight heat and glistening redly. The events manager was pleased with the set up, and as people began to arrive, our team was busy meeting and greeting guests. Someone made a speech, and soon after that we carved the roast. I enjoy carving and serving the roast, seeing how much people enjoy the food and providing excellent service while they taste the food your team has worked so hard preparing. It takes a long time to prepare hog roasts, and it’s not easy. At Taste the Cracklin, we use a special recipe to make our roasts juicy, tender, but with crackling. A guest commented that the apple sauce was really good. To be honest, I never tire of hearing compliments. This week, we made a couple of machine deliveries. We loaded the machines into the van and drove off to drop one off at a community centre, where a charity group were giving a hog roast dinner for some of the people in the local area. We wheeled the machine in and checked it was working, and then we were on our way to one of the villages. We delivered this second machine to a pub, in which a teenage couple were celebrating their engagement. The young man’s dad was already there, fussing over the decorations and wanting everything to be perfect for his boy. We set up the machine, turned it on and as their pig was already in the room, I helped them put it into the machine. It began to turn. The roast didn’t smell as good as ours do, but I knew it would taste good nonetheless. I congratulated the young couple and told them I hoped they would have a good party, and then we stepped out into the night. 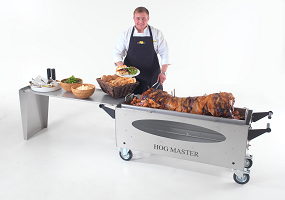 A hog roast caterer’s work is never done. Especially in Rossendale. We came back here, and I went straight back to work doing the paperwork, while all around me I could hear the rest of the team. In the kitchens downstairs, the chefs and kitchen assistants were preparing the food; next door Kirsten was taking orders from clients; in the back room David was stocking wine. The great thing about what we do is, we get to travel to lots of different places, to see the beautiful countryside and to shop in different towns all around the district. Urban sprawl and idyllic village in the same day. Then after a while some of the team went to collect the machines, and soon after it was time to cater for a silver wedding anniversary in one of the towns. We loaded up the van, drove off and soon we were putting up silver balloons and setting tables at the hotel. The dinner went very well; I was pouring drinks and chatting to the guests for most of the evening – several of them wanted to know more about the hog roast, so I was talking to them more than I usually do. They said it tasted really good. Afterwards the couple thanked us and said we did a great job. That always makes me feel good inside.